Martin (left) with 938Live host Keith De Souza. 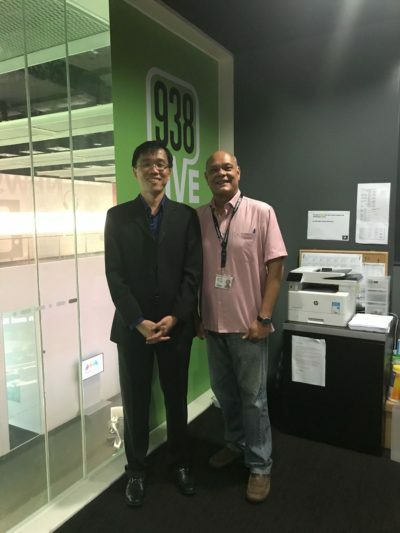 Ingenique Solutions' founder Martin Lim was on on 938Live "Breakfast Club" where he shared his views on Anti-Money Laundering/ Countering the Financing of Terrorism (AML/CFT) awareness among professional firms and small businesses in Singapore. If you have missed out on the interview, here's a replay! What is the state of AML/CFT landscape among businesses in Singapore? How do small businesses fit into the overall Singapore's defence against illicit fund flows and terrorism financing? Difficulties faced by business owners in implementing AML/CFT processes in their businesses. How does Ingenique Solutions' SentroWeb-DJ help small businesses in the fight against money laundering and terrorism financing? ← Veteran lawyer suspended for breaching Law Profession Act AML/CFT Rules – How to conduct customer due diligence?